Sesame plant diseases are not common but can cause widespread crop loss when they occur. Most of the diseases of sesame are fungal or bacterial and are easy to avoid with good cropping practices. More serious problems with sesame stem from pest and weed competition, but this versatile, arid region crop is slow growing and requires early management to prevent plant loss. Continue reading for an overview on sesame diseases and how to avoid or manage them. Aladdin may have said “open sesame” but growers all pray for that occurrence. Open pods signify harvest time and the gathering of the tiny economically important seeds. While sesame plants have few disease issues, some fungal and other problems do crop up. The most serious diseases affect many types of plants but resistant varieties are available to all diseases that have occurred since 1978. A few are still a problem but can be managed. Sick sesame plants may be the result of cultural, pest or disease issues. 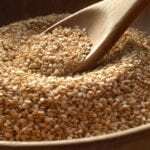 If you are certain all cultural requirements are being met and adequate pest management is in place, the next step is to consider the common diseases of sesame. Sesame plants thrive in dry, warm environments. Boggy soil, excess rainfall, cool temperatures and high humidity encourage the formation of fungal spores and their dissemination. Seedlings are especially prey to fungal diseases. Damping off will kill young plants. Root rots are also a potential problem, although most sesame varieties have been bred to resist these diseases. Crop rotation is the most important management strategy. One of the hardest to diagnose sesame plant diseases is bacterial leaf spot. It looks like many fungal leaf spots. The two bacteria that cause the disease overwinter in soil in plant debris. Their symptoms start out as small brown lesions with yellow edges or irregular, reddish brown spots, dependent upon which bacteria is introduced. The bacteria get onto plants through wind and rain splash. Proper plant spacing and enhanced drainage minimize the risk of transmission. Cleaning the field of all old plant material and practicing a 3-year cycle of rotation will also help prevent the diseases. Sick sesame plants may have other issues outside of disease. Since most varieties available are resistant to the most common diseases, the ailing plants may be victims of weed pressure, improperly prepared soil, crowding, excess moisture, and many more items. Sesame plants are very sensitive to the most common herbicides and can show ill effects from drift of chemical preparations. Always follow the directions on any chemical and use on a wind free day, early in the morning and before the sun is glaring.